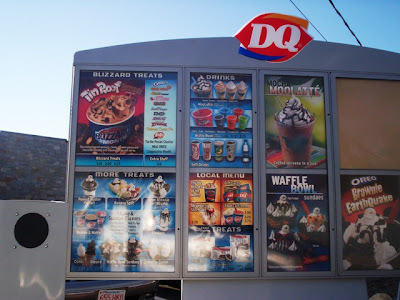 Even before visiting Flo's Clam Shack for lunch, Mom had decided that we should get an ice cream dessert at the Dairy Queen located at 7 East Grove St. in Middleboro, MA. I know it seems a little crazy to drive from Portsmouth, RI, to Middleboro just to have an ice cream, but Mom and I love this place and since it was a beautiful day, we sat back and enjoyed the ride to one of our favorite warm weather spots. We hit DQ at about 5:30 p.m.
Not surprisingly, Dairy Queen was mobbed. This chain is a definite favorite among New England residents, and I still can't believe that there was once one in Fall River - and it closed! It just doesn't seem possible. Although some Dairy Queens have indoor seating, this particular one does not. The only way to place an order is by walking up to the front window or by heading around back and going through the drive-thru. Since we were already sitting, Mom and I figured that the drive-thru was our best best. Actually, we've never been to the walk-up window. We always get turned off by the fact that we a) have to stand, and b) have to wait in the long lines. When we pulled up to the drive-thru menu, a female voice came over the loud speaker and asked us what we wanted. I already knew what I was going to get - a small Cappuccino Heath Blizzard. 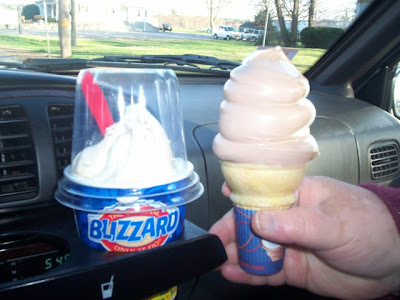 I've been getting the Cappuccino Heath Blizzard on nearly every Dairy Queen visit. After a few minutes, Mom decided on a medium twist (vanilla/chocolate) ice cream cone. Our total came to $5.15 and we were told to drive forward to the next window. When we got to the pickup window, we were greeted by a friendly girl who cashed us out. She also asked if I would like a cover for my Blizzard. I said yes, and was handed my covered Blizzard and Mom's cone. Unlike other drive-thrus, this particular Dairy Queen always provides excellent customer service. I believe she even threw in some napkins as well. What a gal! With ice cream in hand (and in cup holder), I drove us to our favorite Middleboro eating spot - the Middleboro Crossing parking lot. The reason this is our favorite spot is because a) it's close to DQ so our ice cream never has a chance to melt, and b) there is usually a lot going on it that plaza, so we're never bored. Mom adores this ice cream. In her opinion, it is probably the smoothest ice cream she has ever come across. She loves the great flavor and mouthfeel (ick, I hate that word). Her favorite thing to get is just a plain cone. She absolutely loves the way they make their ice cream with a little swirl on top (like a figure eight). The ice cream is thick and always neat, even in the cone. Whatever they do to keep the ice cream in the cone, keep doing it! As for me, I'm in love with the Blizzards. I've had a few different flavors, but my current (and maybe all-time) favorite is the Cappuccino Heath. My suggestion to you is to definitely get the small. Dairy Queen does not skimp on the portions. I believe I got the large once and almost burst my spleen trying to finish it. The ice cream is cappuccino flavored and blended with an appropriate amount of finely chopped Heath Bar pieces. I appreciate this because, although I love big pieces, it's nice to not have to worry about breaking your teeth on a bit of cold candy. I would definitely recommend this treat to any coffee lover. Mom has had this Blizzard a few times and agrees with me. We love it! Although Dairy Queen makes food like burgers and fries, I am not sure if this location serves anything other than ice cream. Since we've only been to the drive-thru, we've become acquainted with what can be handed out of a tiny window. Treats include the Blizzard ($3.10-4.25) which is an ice cream blended with your choice of mix-ins such as Oreo, Reese's Peanut Butter Cup, Butterfinger, M&M, Snickers, Kit Kat, turtle pecan cluster, and mint Oreo pieces. If you want extra stuff in your Blizzard, it is an additional $.50. The Blizzard of the Month is the Tin Roof Brownie, which is very well advertised both on the Web site and at the drive-thru. Other treats include the peanut butter parfait, banana split, Oreo Brownie Earthquake ($3.65), shakes and malts, cones and dipped cones (vanilla, chocolate, and twist), waffle bowl sundaes, waffle cones, sundaes, strawberry shortcake ($3.70), and floats and freezes ($2.50-3.75). You can also order a box of take home treats like the DQ sandwich and the Buster bar. For drinks, you can order your basic soft drink and/or bottled water, but for something extra, try their Moolatte ($2.75-4), which is basically a frozen coffee drink - and it's delicious! If you're not feeling a coffee drink, you can order an Arctic Rush - kind of like their take on slush. It comes in several different flavors. Please note that these prices may vary. Full and satisfied, Mom and I drove away from our eating spot and headed toward home. We both look forward to going back and having another ice cream. I'd also like to find out if this location serves food because I'm dying to try some of their famous burgers. Another plus is that an Orange Julius is going to be sharing space with the DQ, so that gives us one more reason to take the drive to Middleboro. Who knows? Maybe you'll even see us eating in the parking lot. It's a small world. 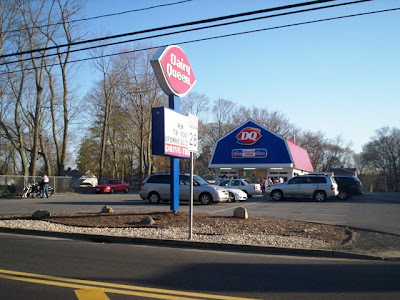 The Dairy Queen in Middleboro is open daily from 11 a.m. to 9:30 p.m. For other locations and hours of operation, visit their Web site at www.dairyqueen.com.